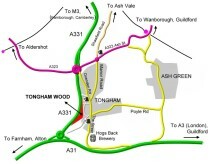 Welcome to Tongham Community Wood! The wood is a triangular area of woodland owned by Surrey County Council, approximately 4.5 hectares in size running along the eastern side of the A331 Blackwater Valley Relief Road. At its centre lies a small area of semi-natural secondary woodland (half a hectare) once used for hazel and ash coppicing. The area is popular with dog walkers, families, joggers and cyclists, is wheelchair friendly and is host to a variety of flora and fauna. 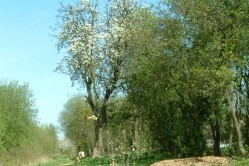 A number of habitats have been developed that visitors can walk around: the orchard brings blossom in spring and fruits in autumn (apple, pear, plum, blackberries, cherries and elderberries); the butterfly glade brims with activity in summer and the wildflower walk becomes full of colour and attractive grasses. Shaded woodland walks can be taken through old oak trees and rest taken at the benches positioned throughout the wood. The whole area is managed by local volunteers through the Tongham Wood Improvement Group (TWIG). Discover more about the group and how to join in, the history of the wood and what you can see there. Web Design: Inside Engineering Ltd. Last Updated:04-Mar-2015. Email twig@tonghamwood.org.uk or Contact for more information.